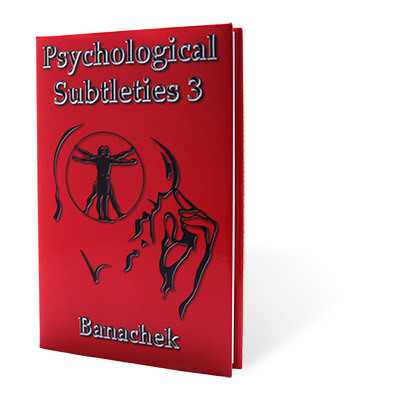 Mentalists all over the world have enjoyed the previous two volumes of Banachek's Psychological Subtleties. That series of books has just got one volume bigger. Continuing on with the same theme and format as the previous two books, Banachek details some of his excellent mentalism in these pages. Along with his one work, he details full routines from: Paul Alberstat, Sean Waters, Robert Domenech, Leonardo Silverio, Colin McLeod, Andrew Gerard, Marc Spelmann, Peter Nardi, Don Marco, Craig Leonard, Peter Arcane, Brad Henderson, Mark Roberts, Leo Boudreau, Jonathan Grant, Tony Binarelli, Docc Hilford, Kenton Knepper, Michael Murray, Richard Busch, Bryan Quinn, Francis J. Menotti, Ravi, Raj Madhok, Greg Arce, David Penn, and Joseph Atmore. The foreword was contributed by the International Man of Mystery, David Berglas.